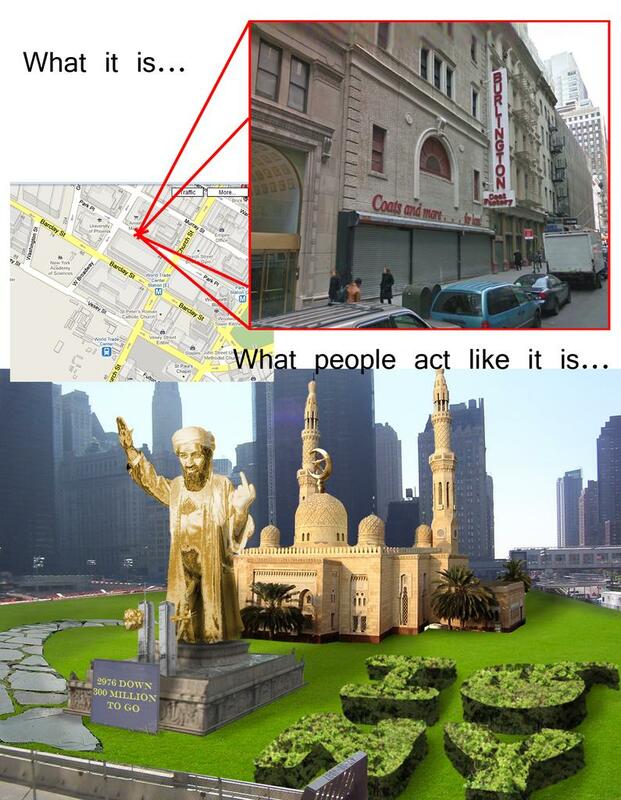 I've finally figured out why folks are so worked up about the Cordoba Center mosque near the WTC site. To be fair, that "I [bomb] NY" in shrubbery is pretty impressive. After issuing a strong statement in favor of the right of Muslims to build a mosque/community center several blocks from the WTC site, the President trimmed his sails slightly, saying that he meant to support only the "legal" right of Muslims to build there (or anywhere). He was not, he said, making any statement about whether he supported the particular decision of the local Muslim community to situate their mosque at that location. How unfortunate. Nobody is going to give credit to the President for trying to slide on through the middle here. The folks who oppose the mosque still will view him as an enemy, and the folks who support the mosque now can effectively lump in the President with the ADL. And all of this comes after the President looked to actually be showing leadership on the matter. The issues here are very clear. People have the right to build religious buildings to serve their local community. There should not be a mosque-exclusion-zone of indeterminate radius in south Manhattan. Asking the community to relocate is not just patronizing, it's idiotic -- the community center is designed to serve the Muslim community that already exists in southern Manhattan -- it doesn't do them any good to build out in Queens. No joke, I've been wanting something like this to exist for years. During the Vietnam War, Hannah Arendt noted that members of the Democratic Administration had frequent recourse to phrases like "monolithic communism," and "second Munich," and deduced from this an inability "to confront reality on its own terms because they had always some parallels in mind that 'helped' them to understand those terms." When I was college, it was common for student activists to call slavery "the Black Holocaust" or "The Real Holocaust." There's an argument to be made about America, and the stories we tell ourselves when we see ourselves as heroic, and when we don't. But most of these activists--some of them anti-Semites--knew very little about Jews, Europe, Nazism nor, frankly, slavery. And they didn't much care. They were not interested in specifics. They were interested in leveraging the moral power of other people's experience, in order to bolster the moral power of their own. It was narcissism, laziness, and basic lack of respect--not simply for the Jewish experience--but for the specifics of the African-American experience. I've stated my distaste for the appropriation of "Holocaust" to other contexts in general. And I think that Coates is right both that such a move is both demonstrative of a lack of imagination, and represents an astoundingly disrespectful attempt to leverage one group's experience on behalf of another (often without that group's consent, and often -- as Jews well know -- against the group itself). A major part of my comment thesis is that courts don't protect the politically powerless, but rather only intervene once a marginalized group has demonstrated some clout in the political arena. And wouldn't you know it if, fresh on the heels of Judge Walker's historic opinion striking down California's anti-gay marriage constitutional amendment, we see a poll indicating that half of all Americans agree with him. Of course, my suspicion is that these things aren't independent of each other. High profile gay marriage victories make it more likely that more people will label themselves in support of gay marriage, because the position has moved from fringe to mainstream (and people generally don't like to consider themselves fringe). At the same time, of course, growing popular support for gay marriage is what makes pro-gay marriage rulings feasible -- it's what moves them from "kooky, frivolous argument" to "position I have to take seriously". I should say that I don't think whether gay marriage is constitutionally protected is dependent on whether a majority wills it so. I just think descriptively, judicial recognition of gay rights (or really any rights claim) seems to move in tandem with popular recognition of the same. Rule 32 of the Federal Rules of Civil Procedure allows depositions to be used by an adverse party "for any purpose". A clever lawyer read that language literally, giving us this colloquy (quoted in Wright and Miller, Federal Practice and Procedure Sec. 2141 n. 1). Ms. Olschner: Your Honor, at this time, I would like to swat Mr. Buck in the head with his client's deposition. Ms. Olschner: No sir, I mean swat him in the head with it. Pursuant to Rule 32, I may use this deposition for any purpose, and that is the purpose for which I want to use it. The Court: Well, it does say that. (pause) There being no objection, you may proceed. Ms. Olschner: Thank you, Judge Hanes. (Whereupon, Ms. Olschner swatted Mr. Buck in the head with the deposition). You never know what new trial tactics will emerge if you read the rules closely enough. That's a tip, kids, write it down. To be sure, a deliberate attempt to provoke is not akin to an accidental one. Nonetheless, it does not seem to occur to them that, while certainly the right to build a bar is not a bedrock tenet of America's civic traditions like building a house of worship is, there certainly is no reason why Muslims or anyone else should be able to prevent an otherwise legal and properly zoned* gay bar just because they find it offensive. * Of course, as the post seems to recognize, zoning laws do sometimes take issue with bars being opened right next to houses of worship. In any event, assuming that there are no zoning issues -- sure, build the bar. I have no quarrel with it.